The Rebels are Going Dancin! 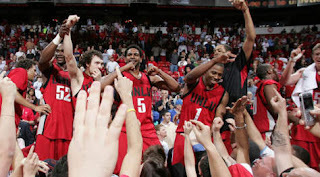 The UNLV Rebels are going Dancing this year! I did not know what that meant in the past, but now since I attend just about every basketball game, I know what that means! We won the Mountain Western Conference tournament. I am so excited for them. 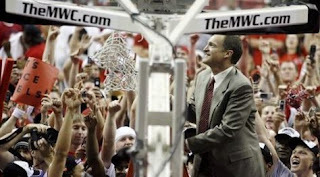 If you look hard at the picture of the Coach cutting down the net, you can see K.C.’s big white head staring on. I had to rush the court too. I needed to experience this at least once in my life while I am still young. It was so much fun! I felt like I couldn’t breathe, but it was worth it. I have not had time to post much due to my time being taken up by grading many papers. This week is our anniversary (4 years!) and we are going to watch Phantom of the Opera. I am very excited to go on another date with my wonderful hubby. Well when I get a chance, I will post more pictures as well as try the 100 things you may not know about me. So what else has been going on in my life? We got REBEL FEVER!!! !Oh my heck Ryan is going crazy! He can’t believe they got a 7 seed though- that is crap! We’re excited!!!! Thats so cool to see KC’s head!!!! I knew you guys had Rebel Fever!!!!! It was sooo much fun. K.C. almost cried when he found out we ONLY got a 7 seed. The Rebels will just have to be the George Mason this year an pull many upsets! GO REBELS! I just learned what going dancing means too. I hope they do good Friday. I’m sure K.c. will be watching.Glad to see your blogging again. We’re waiting for your 100 list. It’s coming….it’s coming. I think I got some interesting things you may not know about me. I need a good hour to do it so I hear.